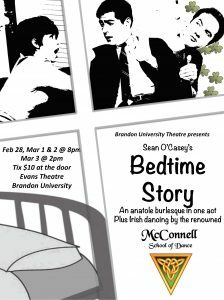 Brandon University (BU) Theatre is proud to present Irish entertainment in the Evans Theatre. BU Theatre will perform “Bedtime Story: An Anatole Burlesque in One Act” by Irish playwright Sean O’Casey on from Thursday, Feb. 28 to Sunday, March 3 at the Evans Theatre. Brandon University Theatre will present “Bedtime Story: An Anatole Burlesque in One Act” from February 28 to March 3 at the Evans Theatre. Starting the program will be a whirl of skirt and curls as the renowned McConnell Irish dancers perform. This will be a chance to see them again for those who miss their performances at the Irish pavilion from past years at the Westman Multicultural Festival and the Winter Festival in Brandon. In “Bedtime Story” he displays a deft hand at comedy. A respectable Catholic bachelor invites a “gay lass” back to his room in a Dublin boarding house circa 1950. Terrified that his landlady and a fellow lodger may discover his indiscretion, he tries to get the girl quietly out of the house in the middle of the night. Part romantic comedy and part farce, this is a morality tale of the consequences of one’s actions. The play is directed by James Forsythe, with Brett Kline, Lexi Hacault, Michael Brooks and Josh Wade, and is Stage Managed by Jaysa Davies. Performances at the Evans Theatre on the BU campus will begin at 8 p.m. on February 28 and March 1 and 2. The March 3 show will begin at 2 p.m. Tickets are $10 at the door.